“A sumptuously illustrated book which will delight idolaters of high fashion and movie stardom” (The Times Literary Supplement). 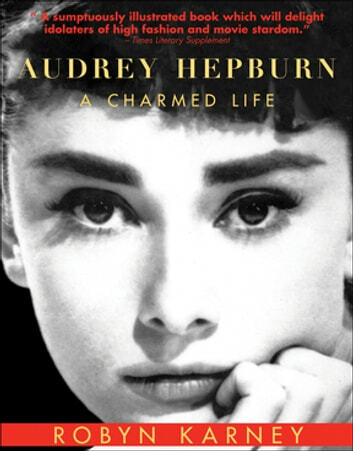 In both words and stunning photographs, this book tells the story of beloved fashion icon and actress Audrey Hepburn’s life: from her childhood in Nazi-occupied Holland, through her early aspirations to become a ballet dancer, her onscreen debut, and her years as one of Hollywood’s most sought-after stars, and into her later life working among the poorest children of the Third World. Starting out in some minor revue and film roles in London, Hepburn was spotted by the writer Colette, who immediately cast her in the central role of a Broadway adaptation of her story, Gigi. Soon afterward, Hepburn was offered a role alongside Gregory Peck in Roman Holiday, for which she collected an Oscar for Best Actress. The book highlights all her success that followed: she won the Tony Award for Best Actress for Ondine, captivated audiences as Natasha in War and Peace, and was highly praised for her brilliance in a serious role in The Nun’s Story. Hepburn’s style was perfection, and her clothes—many of them designed by Givenchy, who dressed her for Funny Face in 1957—placed her on the world’s Best-Dressed Women list for several consecutive years. This photo-filled book celebrates the personality and sensuous yet untouchable beauty that made Audrey Hepburn irresistible.